What's more, the free Wolverhampton Privilege Card gives you great city centre discounts and offers. Choose from a wide variety of restaurants, cafes and bars to suit all tastes and pockets. Wolverhampton's Art Gallery in Lichfield Street houses collections of art from the 1700's to the present day and features internationally renowned Pop Art and Northern Ireland collections. The Visitor Information Point is also located here. The Grand Theatre in Lichfield Street is one of the country's leading regional theatres and the small, intimate Arena Theatre in Wulfruna Street presents one of the best and most diverse theatre programmes in the West Midlands. The independent Cinema at the Light House Media Centre in Chubb Street, hosts photography exhibitions, media events and international film and animation festivals. The Civic and Wulfrun Halls in North Street and the Slade Rooms in Broad Street host a mix of world renowned bands, comedy acts, up and coming bands, classical music and sporting events. Explore Wolverhampton's past and present, and enjoy the heritage of the city - the statue of Lady Wulfruna, after whom the city was named, St Peter's Church and Gardens, the modern fountain in Queen Square and the statue of Prince Albert are all landmarks that feature in the Wolverhampton City Centre Walking Trail available from the Visitor Information Point. The walking trail covers 1.6 km (1 mile) and is suitable for wheelchairs and pushchairs. Take a tour of Bank's Brewery, where the Black Country's finest ales have been brewed since 1875, and see how traditional brewing methods have evolved. 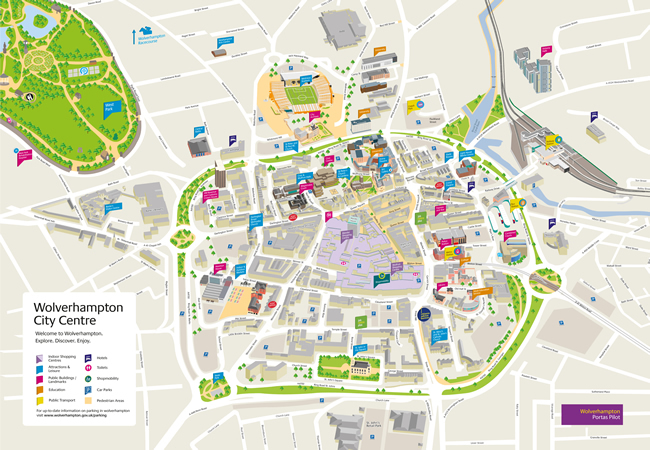 Wolverhampton is easily accessible from all parts of the UK. The city's state of the art Bus Station, Railway Station and Metro are all located in the city centre and are all within a short walking distance of each other. The free City Centre Bus operates around the city 4 days a week between 9.40am and 2.20pm. www.wolverhampton.gov.uk/freebus. Home to Wolverhampton Wanderers Football Club, Molineux Stadium has a fantastic atmosphere on match days and houses the new Wolves Museum. Experience the excitement of racing at Wolverhampton Racecourse and Holiday Inn Hotel, located less than 2 miles north of the City Centre. For a directory of retailers, brands, restaurants, bars, banks, businesses, attractions, car parks and the latest news and events visit WVOne.